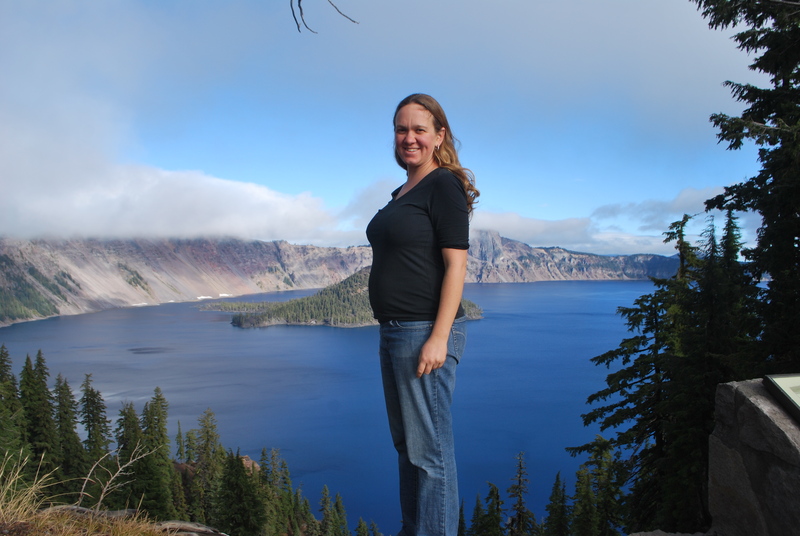 19 weeks, at Crater Lake! If you haven’t heard, we have some big news at Cast Iron Idaho. We are expecting a baby, sometime around March 29, 2012! Marty and I are super excited about our growing family. Not to mention my growing belly, and what to feed it! So far, pregnancy has been wonderful. Besides the inherent joy in growing a new little one, pregnancy requires moms to actually take care of their bodies at a higher level than usual, including things like not drinking, not skipping meals, exercising regularly, and going to bed early. All of these make me feel amazing! Pregnancy these days also comes with a long list of rules for eating. Sushi, certain cheeses, excessive caffeine, and other things are prohibited, and your body needs extra of other things. I read a great book called What to Eat, Before, During, and After Pregnancy, by Judith E. Brown. It goes into a lot of detail, but the big-picture message is; When pregnant, moms need an extra 300 calories a day. This isn’t much, but women need almost double the amount of protein, and extra calcium and iron. So, those 300 calories should be protein-rich. We’re continuing to eat our regular healthy diet, but pumping up my meat intake a little, and trying to satisfy my extra hunger with protein-rich snacks. So far I like raw almonds, apple slices with peanut butter on them, and plenty of yogurt and cheese. We also heard on NPR that the little guy/girl can develop tastes for certain foods later on, based on what mom ate during pregnancy. So we are trying to feed him/her the foods we want him/her to like. Like kale. 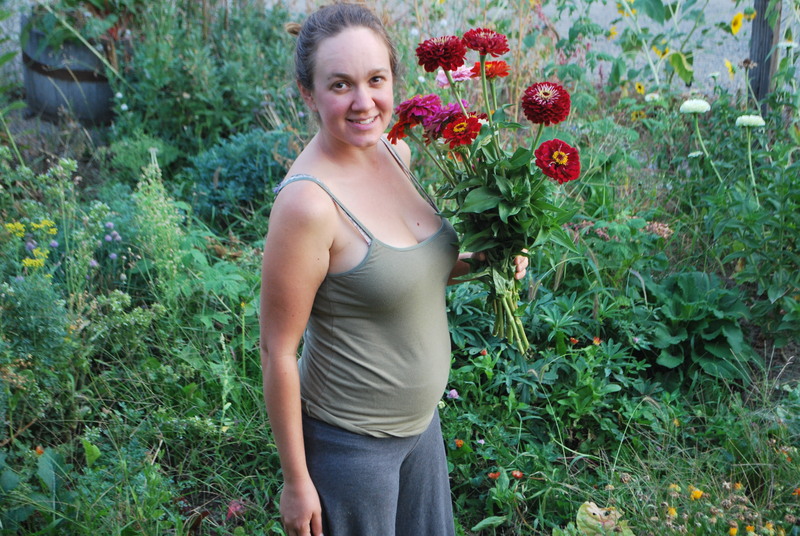 Early on in pregnancy, I had no nausea (lucky!) but had headaches more frequently than usual. Since I couldn’t take Ibuprofen, it was hard to kick them. So, I came up with a natural headache tonic, suggested in one of my pregnancy books: One quart of water and about a tablespoon of powdered ginger. Less if you don’t like it too spicy. Shake and drink very cold. It’s delicious, and seemed to help relive the headaches. Maybe I was just dehydrated. 12 weeks, last of the summer flowers! Q: How are you feeling? A: Awesome! See above. Q: Do you know if it’s a boy or a girl? A: It’s a little too early to know, but we’re not going to find out til it’s born! Surprises are better! Q: What did Marty say? A: A lot of things, but he’s excited. Q: Where are you getting prenatal care? A: Treasure Valley Midwives. Check out their webpage. Q: Names? A: We’re taking suggestions. Marty likes flower or tree names. I’ve vetoed Dandelion and Cedar Bark. Q: Are you accepting donations of used baby goods? A: Why yes. We haven’t had a baby before and will need to get some things. People have given us some things already. Things I think we need: cloth diapers, car seat that isn’t expired, stroller that attaches to a car seat and/or jogging stroller, co-sleeper, baby carrier, bumbo seat, breast pump, crib bedding, moderate amount of clothes and baby blankets. And probably a million things I haven’t thought of. Marty does not want any plastic toys, only wood or cloth, and books. He doesn’t want the little one gnawing on petroleum products just yet. If you haven’t a clue about babies and want to send us something, send me some new music to listen to while I’m in labor. Workout music? Soothing music? Dunno! Music for the baby would also be great. What do your kids like? We are excited about this adventure! Tags: belly pics, Cast Iron Baby, eating in pregnancy, Katie Painter, Marty Camberlango, natural headache remedy. Bookmark the permalink. Yeah! 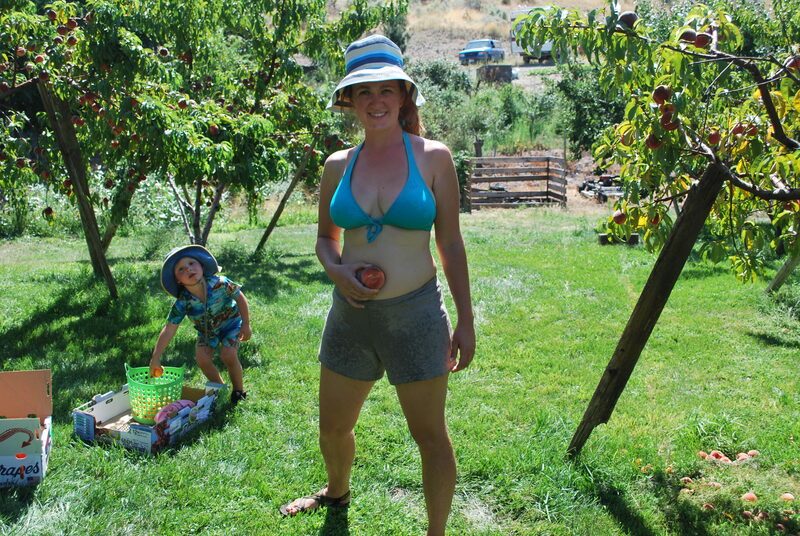 Love the belly shots — hope this child is enjoying hisher time in the garden. The one at crater lake is so great, I think you need to go back and get a full term shot! Don’t know if I’ll be up for an 8 hour car trip at full term, but I do like the crater lake shot. Fortunately there are closer mountains and lakes. Basically I was waiting for a good belly shot to make this blog post! PS — I like Linden and Willow. Reed and Brook. All names that don’t go so well with Waters, so you can have them! you also forgot to mention the prenatal massages you will need — i think that’s an important baby gift. Speaking to babies developing a taste for foods in the womb. My Fiance Kerri is from Maine and her Mom ate lobster nearly every day that she was pregnant with her. To this day Kerri can’t eat lobster, shrimp, oysters or any other “fishy” seafood. Though she likes mild white fish quite a bit. To us it has always seemed like proof that you develop your tastes in the womb, although for Kerri I guess it ended up being a bit of overload. At any rate, I don’t know you two really well, but congratulations on your pregnancy. Babies rock. Funny! My mom apparently ate a lot of tuna, which I’ve never liked til recently. Now, sadly, you’re supposed to limit fish intake because of mercury levels, and take fish oil tablets instead to give the baby the brain building benefits. I’ve also heard that eating too many peanuts or peanut butter can contribute to food allergies in the baby, but I don’t know if that’s true. Fortunately, I don’t have any weird cravings where I need to eat a certain thing all the time. Thanks for the note! Love love LOVE the pics and can’t wait for my new niece/nephew to arrive!!!! Awesome pictures Katie! Kat and I are so excited for you guys. See you soon – ill try to give you a call sometime. Love your entry! I miss my flowers in the garden! Both my kids love food and I ate everything under the sun both times so I agree on creating good eating habit’s from the very beginning . I believe I even made myself go into labor both times with food. Ginger I had a wild craving for (pickled) Jalapenos stuffed with creamed goat chez. I must have ate 20 of them. Later that night she came! Van got the boot by Curry’s and super hot tom kai gai a Thai chicken soup. I think they were like WERE OUTTA HERE! Now they love those flavor’s just not as hot as I seamed to crave in my last day’s of the pregnancy’s. Congrats on the little one Katie. I can’t believe you are going to be able to wait to find out what your having. I would never be able to last that long. There is hope…Lea loves to eat kale raw right off the plant! And I didn’t even eat a lot of it when preggo with her. WooHoo! Congratualtions to you both. You are so darn cute preggers. Parenthood is an awesome ride for sure. Glad you are hopping on! You guys will have to come over and dig through my boxes of baby stuff to see what you could use, it’s all girl though. I also ran into some maternity leggings that would be nice and warm this winter for bed, or comfy clothes, or just under stuff. Rose’s Birth Story, aka the Taco Story. Dutch Oven Pineapple Upside Down Cake!